One way to serialize a binary tree is to use pre-order traversal. When we encounter a non-null node, we record the node's value. If it is a null node, we record using a sentinel value such as #. For example, the above binary tree can be serialized to the string "9,3,4,#,#,1,#,#,2,#,6,#,#", where # represents a null node. Given a string of comma separated values, verify whether it is a correct preorder traversal serialization of a binary tree. Find an algorithm without reconstructing the tree. We can keep trimming the leaves until there is no one to remove. 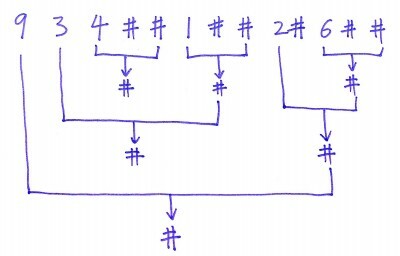 If a sequence is like "4 # #", change it to "#" and continue. A stack is a good date structure for this purpose. Try this one: [9,3,#,#,#], per your code is [0, +2, -1, -1, -1] = – 1 => fails, however the tree and the serialization are correct: [(root = 9): left = 3, right = #], [(node = 3): left = #, right = #]. If you move the [node=3] from the left side to the right side you get a fail again. The code above won’t work in case of “A, B, #, #, #” which is a valid serialization of a root node A with a left child B.
Disclaimer: I don’t think I’m breaking the condition of “not reconstruct the tree” since I’m not doing it per-se.